Every day, on average, 108 people join the Seventh-day Adventist hurch in North America either through baptism or profession of faith, according to G. Alexander Bryant, executive secretary of the Church’s North American Division. Bryant told more than 300 delegates to the North American Division’s Year-End meeting there are 1,154,428 Seventh-day Adventists worshipping in 5,413 churches and 773 companies across the North American Division as of June 30, 2012. Net membership growth in North America for the year ending June 30 was 1.35-percent, he said, down modestly– .33-percent –from the year before, and down eight-tenths of a percent from 2009, the second part of a division-wide evangelistic outreach. More than 450,000 people joined the Seventh-day Adventist Church in North America since the year 2000, Bryant said. 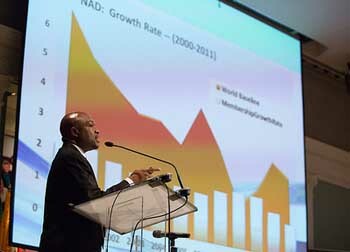 He noted, however, that the 2011-2012 NAD growth rate was substantially below that of the Seventh-day Adventist Church worldwide. Adding to the complicated membership picture are the numbers of lost and deceased members compared with those joining the church. In the six year period of 2006 through the end of 2011, a total of 240,891 joined the movement in North America. However, a total of 130,929 members either died, were missing from church activities (i.e., no longer in regular contact with the church) or dropped out. So for the six-year period, Bryant said, the net membership gain was 109,962 members.